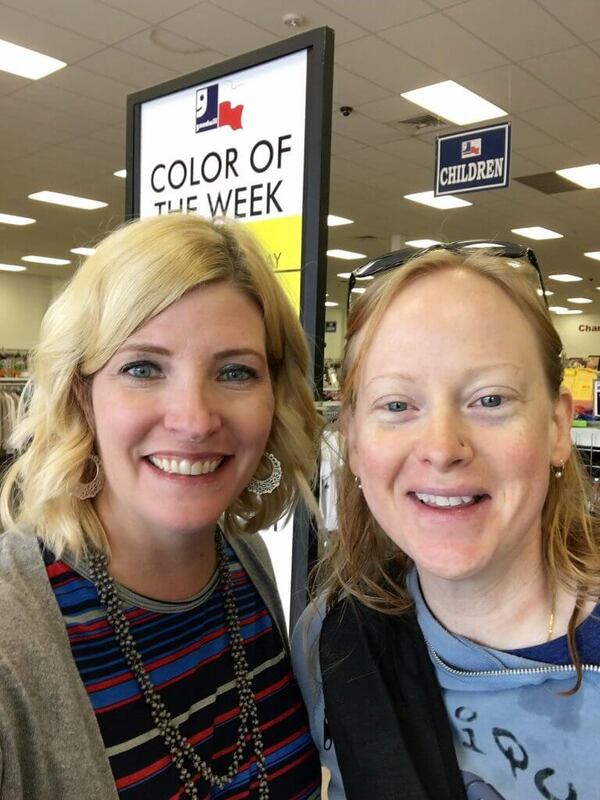 One of the things I love most is seeing new friends adopting the thrift life! I love going thrifting with them and seeing that spark ignite! It’s not just the good deals or the sustainability of secondhand shopping that lights the fire; it’s the fun of it! 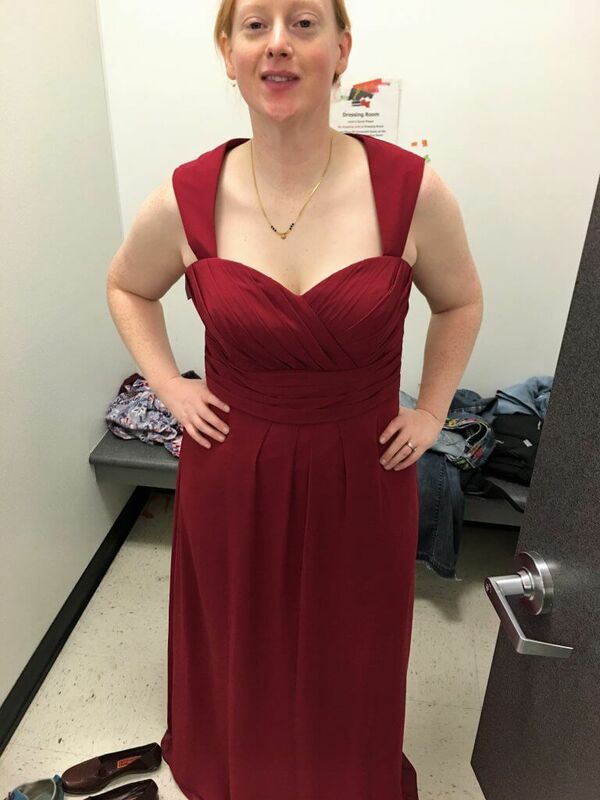 So when my friend Terri asked if I’d go with her to help her thrift a formal dress for an upcoming Christmas party, I was thrilled! AND Terri heartily agreed to my standard selfie requirement! The whole back wall is covered in dresses. Some formal wear is set aside and individually priced in another section, but it doesn’t hold *all* the formal wear. 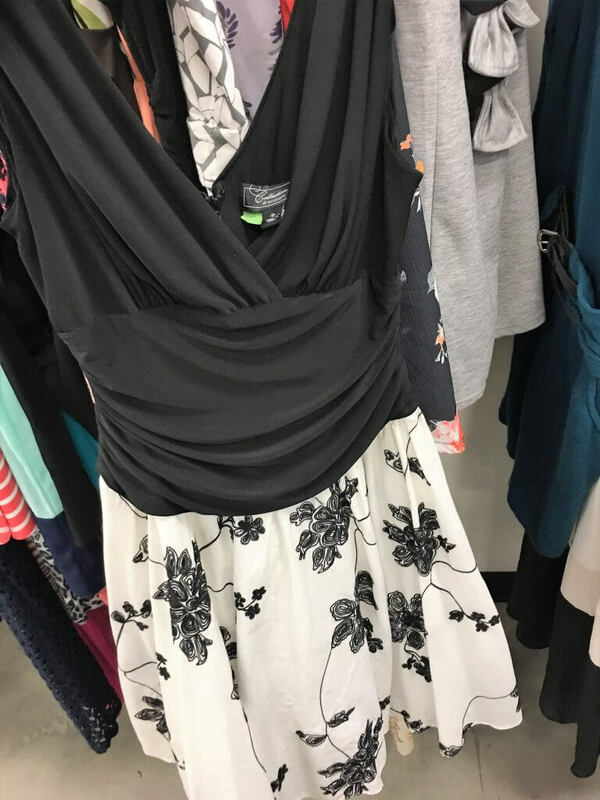 There were many fancy dresses in the regular dress section at regular prices – $8 plus the colour tag sale! Look what I spotted! 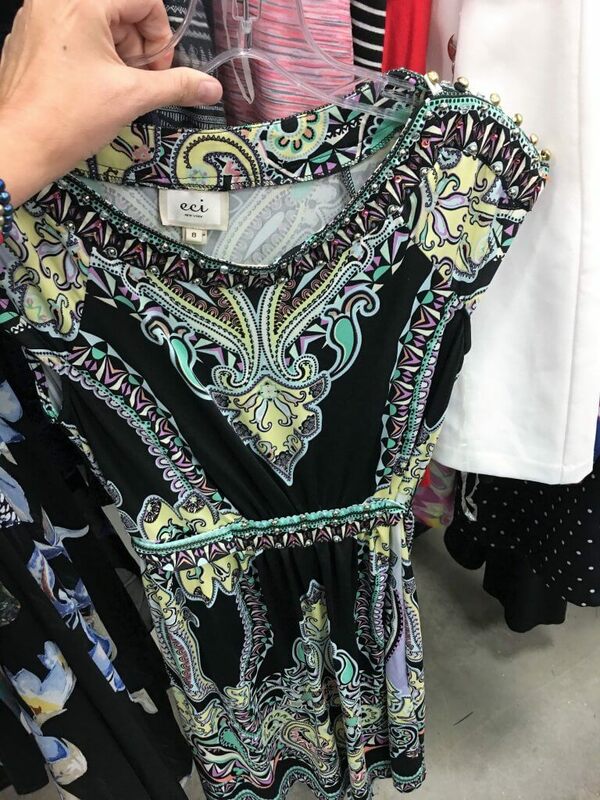 It’s my FAVOURITE dress in a different pattern and size! Of course, I can’t find a picture of said fave dress at the moment but I’ll look! Terri liked this dress but deemed it too casual. I just had to stop for a minute and admire this vintage green dress! 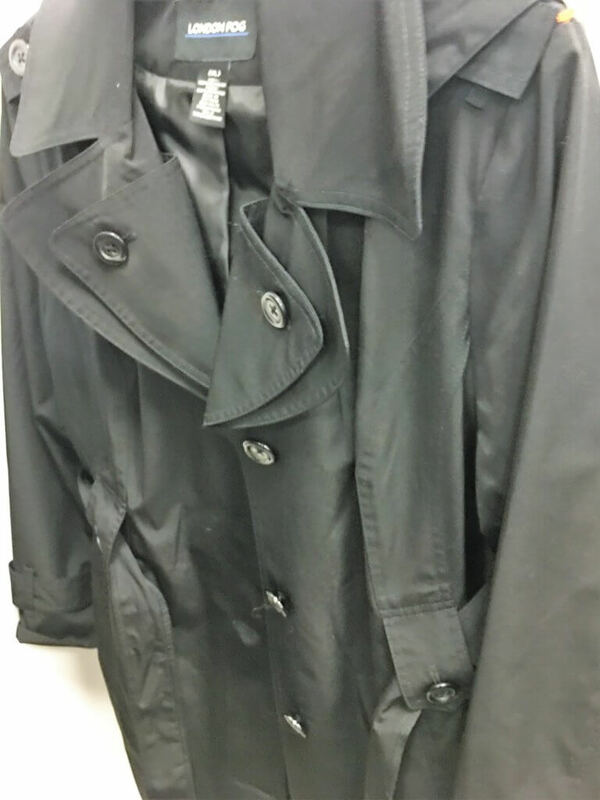 We both loved this London Fog rain coat in impeccable condition but it was a big big on both of us. Too bad but I could have used it TODAY. 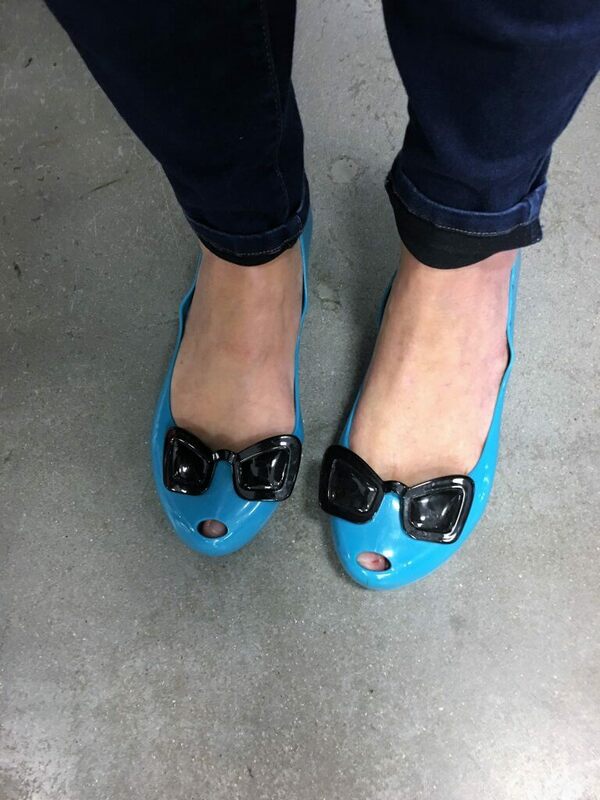 These leather slides almost came home with me before I noticed them peeling at the toe area. Terri and I do NOT have the same size feet so there was no competition there (!) and she took my advice and wore shoe options around while shopping to gauge comfort. She was VERY successful, you’ll see later! And then there were these. WHY???? These are preposterous. in poor condition. 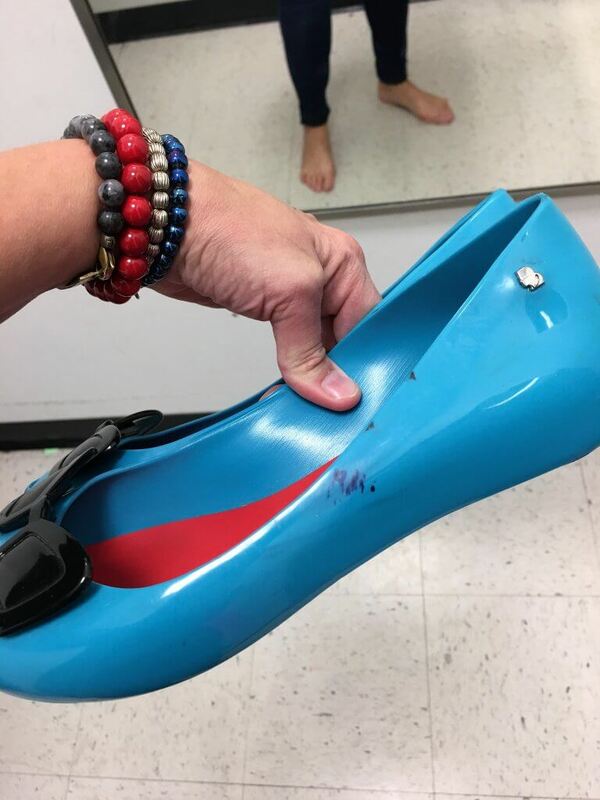 I could tell that whoever had these tried to get the marks off. So I left them behind. I MISS YOU!!!! On a more positive note, Terri and her tiny sz 6.5 -7 feet found more shoes than she could handle! 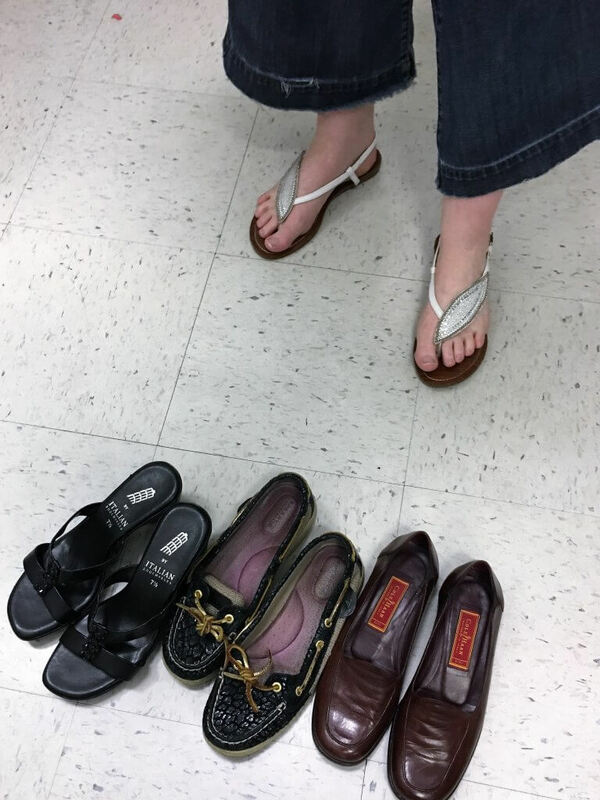 These are the ones that made the final cut: sparkly thong sandals, black wedge sandals, Sperry’s in mint condition and Cole Haan burgundy loafers in excellent condition and soft as butter! Well done Terri! Now for the fitting room shots! 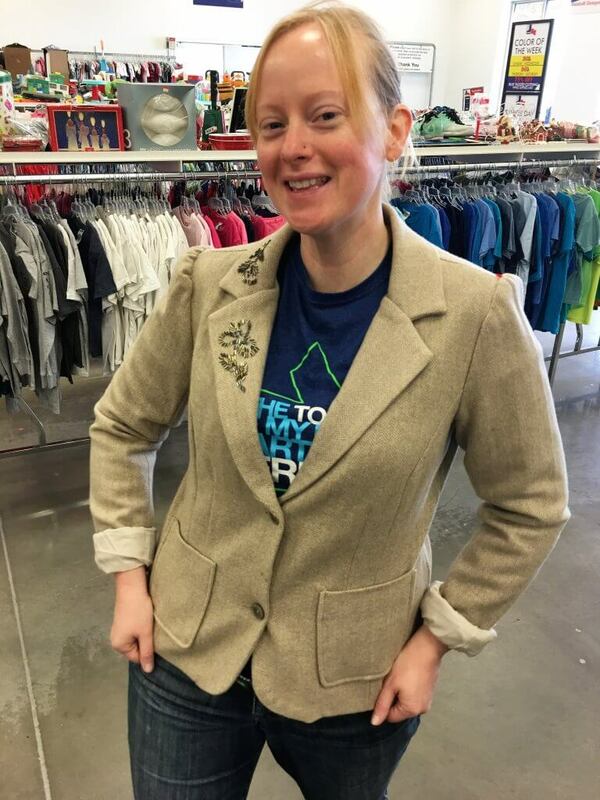 Terri scored this embellished blazer which can be worn inside her chilly office or on the walk from the metro (or whatever it’s called here – I’m just so happy to learn there IS some kind of public transportation in Houston) to her office in the cooler months. Also looks cute over a graphic tee with jeans! This top brings out Terri’s eyes! So pretty! 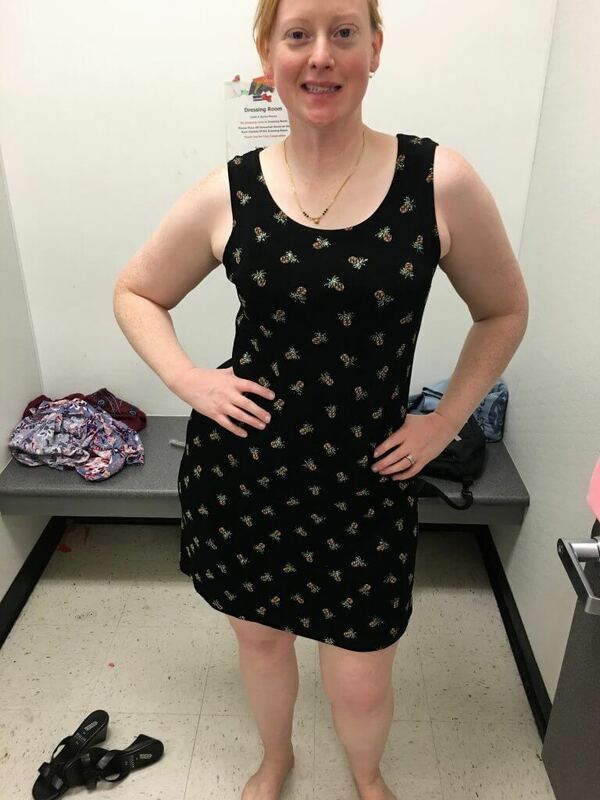 We both loved this dress as a work option but it was too big. However, now Terri knows that she likes this style and can look for something similar on future thrift stops or on Poshmark. This one was a keeper though! It makes work dressing a cinch – dress + shoes and go! 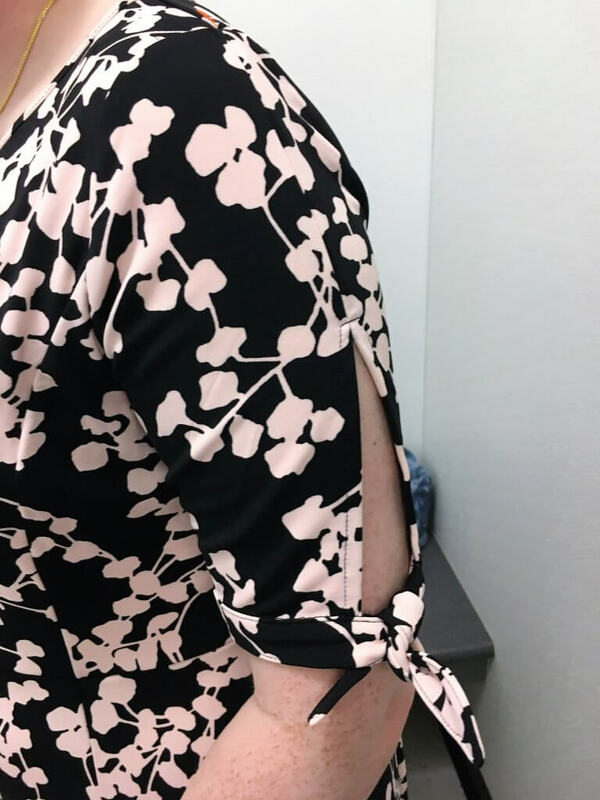 Just look at the pretty details on the sleeves! WHO WEARS ROMPERS? It was long enough in the torso but an awkward fit. Separates get you way more mileage. WHO WEARS BEDAZZLED PINEAPPLE DRESSES? Well, Terri does now! And I would have too! This dress is super cute and casual and will be great for Houston summers or on her upcoming cruise vacay. 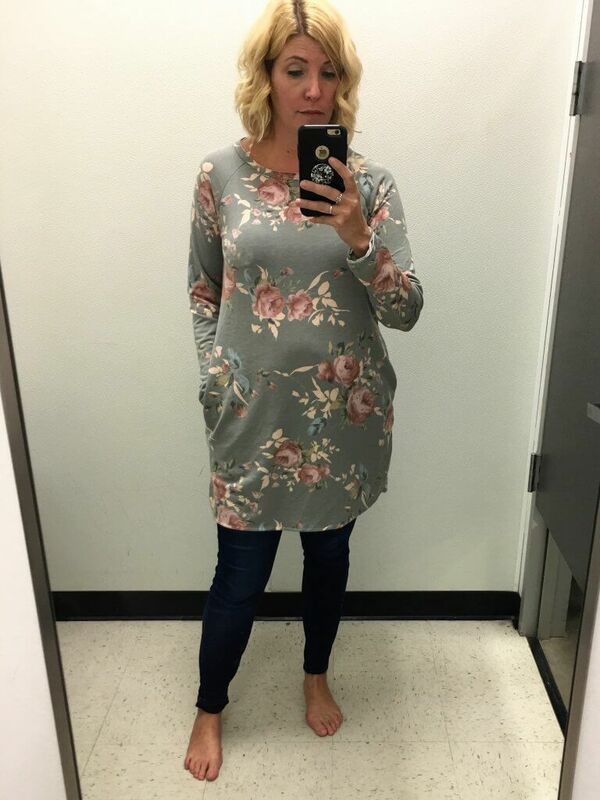 As for me, I scored this comfy grey floral “dress” with pockets! It’s light enough for Houston “winter” and everything I want for comfort! 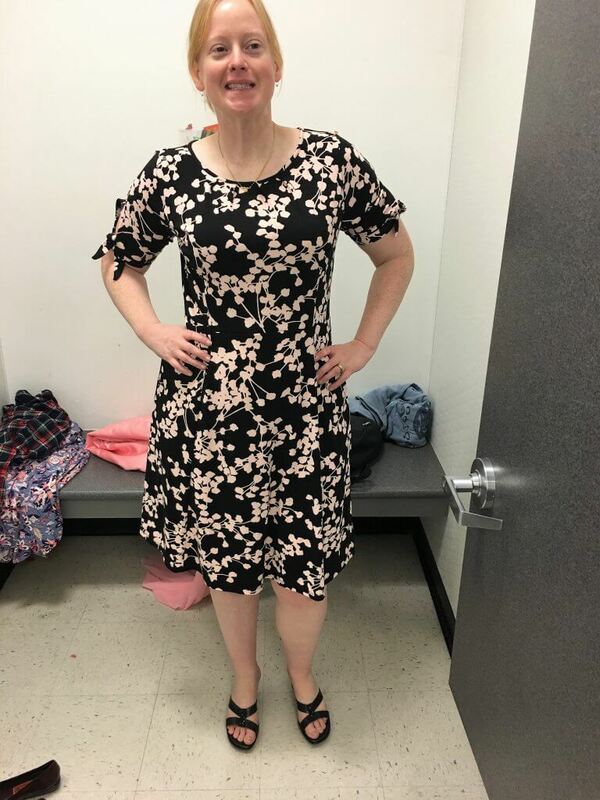 Terri tried quite a few dresses actually but there were two main contenders. This red beauty which was sadly too big at the bust! You HAVE to try on formal wear because the size on the tag is IRRELEVANT. Formal wear tends to run small compared to the size tag so don’t even look at the tag – look at the garment then try it on! 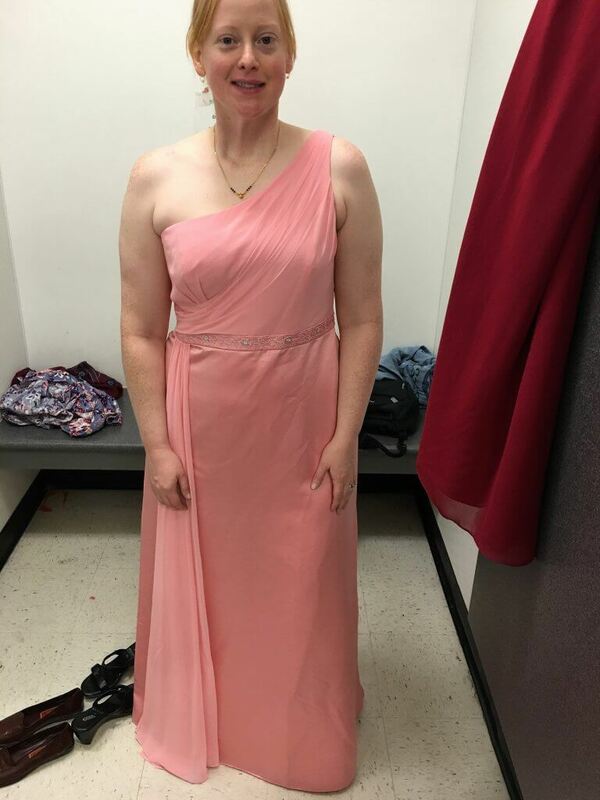 Terri accomplished her mission to thrift a formal gown with this beautiful peachy coral dress! The colour looked AH-MAZING on Terri and it is in perfect condition. The price? $20! 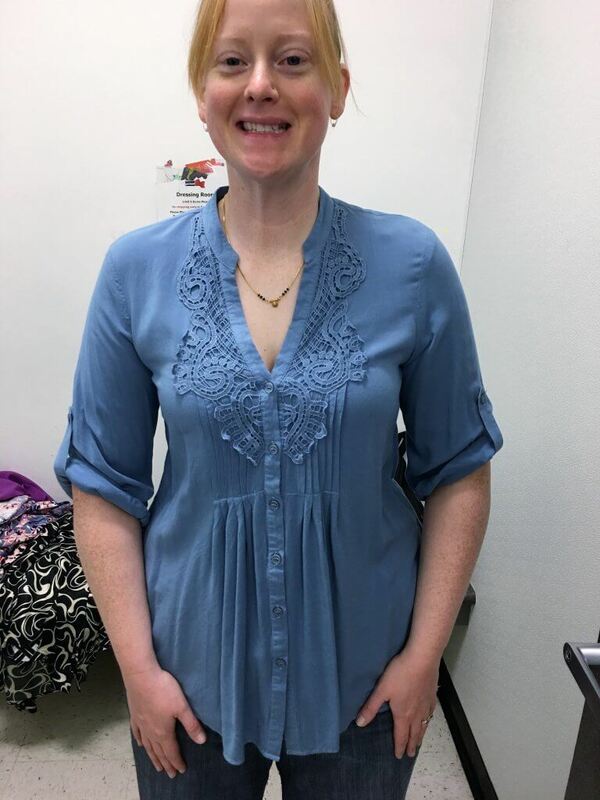 While browsing, Terri and I discussed thrifting formal wear versus doing something like Rent the Runway which is a formal wear rental service. 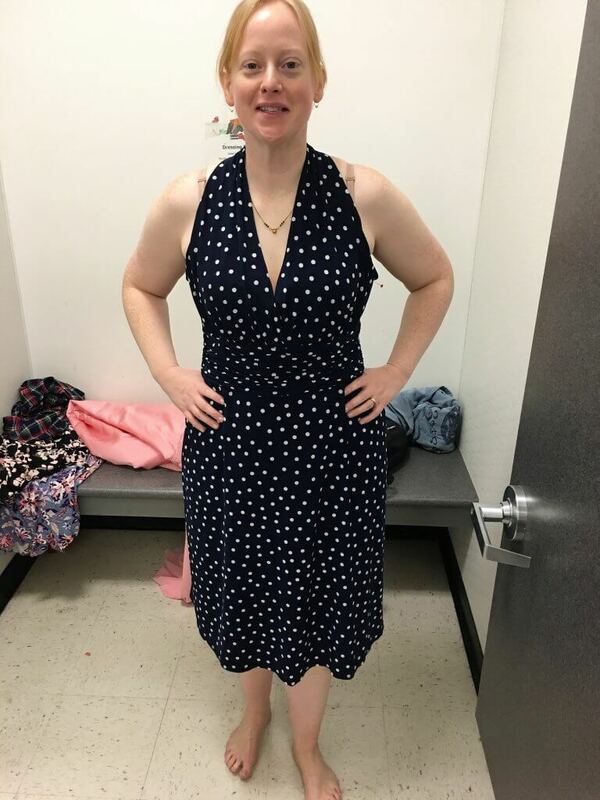 Though Rent the Runway is better than buying new, it is still way pricier than thrifting a gown. The advantage is that you’re not left with a formal gown that you’ll never wear again BUT to that I say, spend a fraction of the price and thrift then donate it again if you don’t want to keep it around. As for Terri, she will take this gorgeous gown with her on her upcoming cruise vacation for the formal dinners! WIN WIN! Terri plans to have the dress professional cleaned and pressed as per the tag recommendation. I would probably cheap out and wash it at home then iron it myself. It is 100% polyester so I know it is washable despite what the tag says and I’m a confident presser but if you’re not, leave your precious gown in the hands of experts! 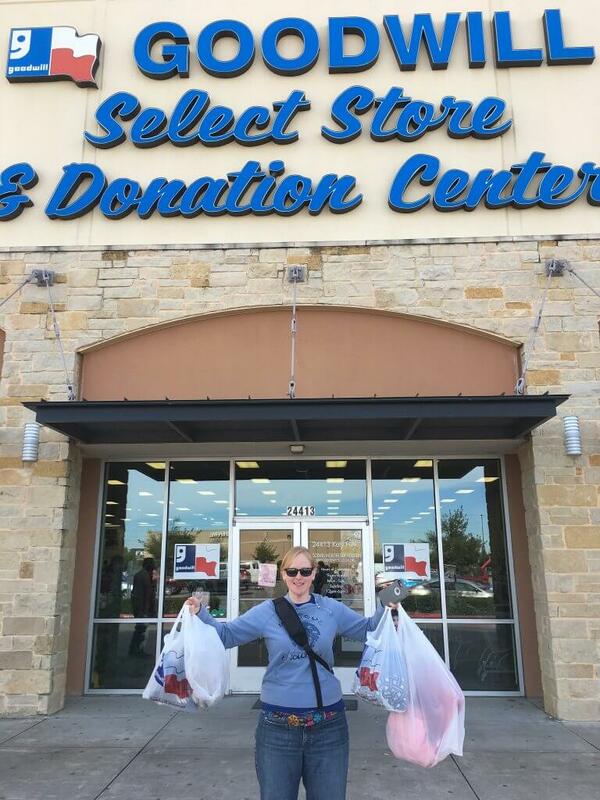 All total, Terri scored 12 pieces for $74 which works out to a cost per item of $6.17 including her formal gown! 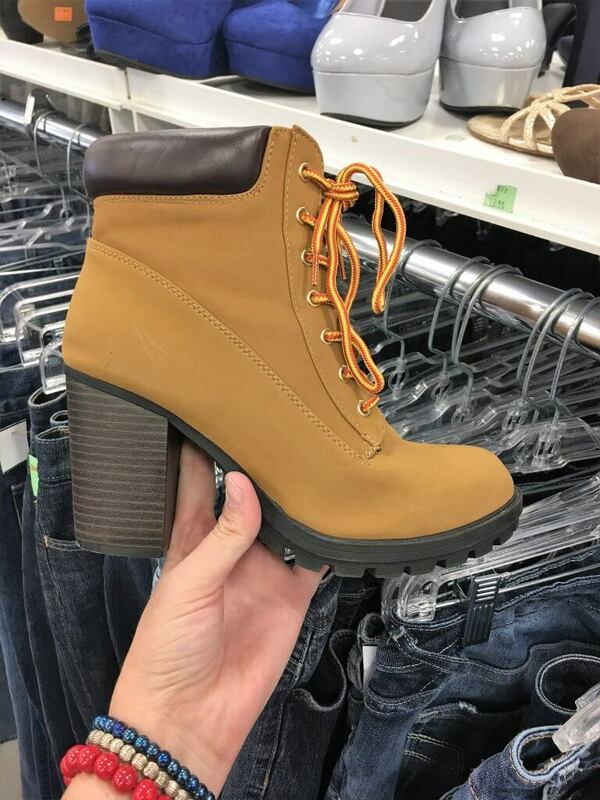 Do you feel that thrifting spark when you read that?!!! So there you have it! 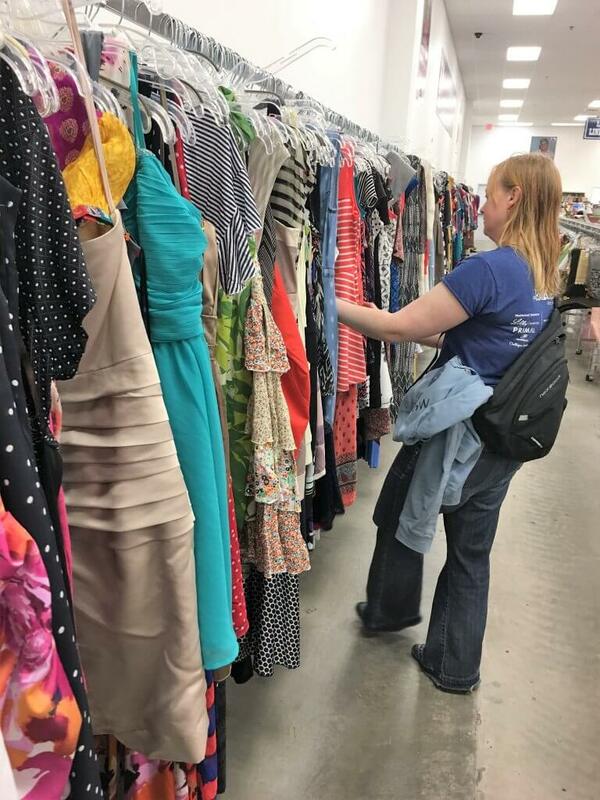 If you have a formal event coming up – a party, wedding or even homecoming or prom, consider secondhand shopping to thrift your formal dress. It makes so much sense and you’ll look just as fab as those who spent five times more! Have you ever thrifted formal wear? I’d love to hear about it! follow THE SPIRITED THRIFTER on Pinterest! 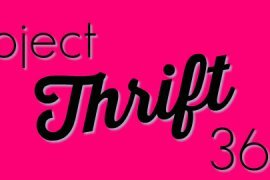 Please consider supporting The Spirited Thrifter on Patreon. Always love your adventures! 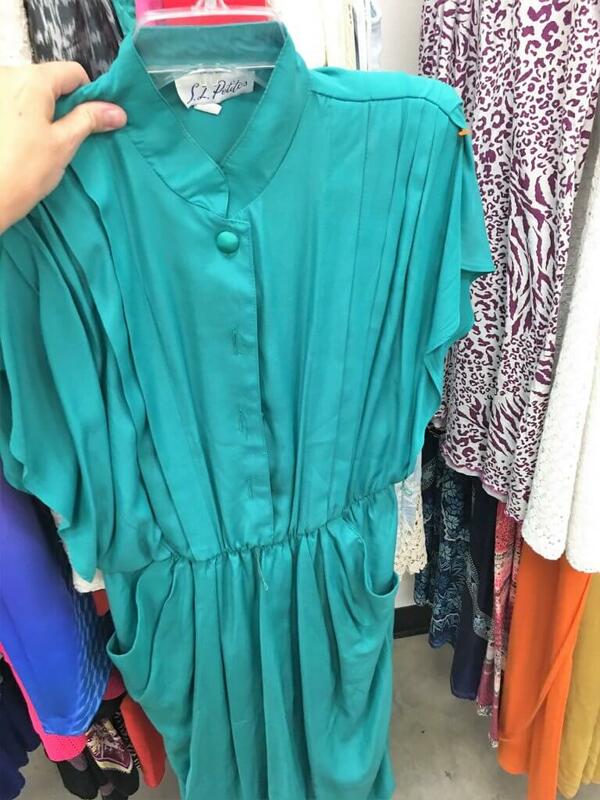 Where is this Goodwill located? Although I’ve scored at the one on I-10 (and Lilah made out like a bandit on our excursion), I haven’t had luck in clothing. Home goods, yes. This was at the i10 location! I have had luck at all the Goodwills but not necessarily every time I go. That’s the fun of it! In your post you talk about cleaning/dry cleaning. Do you ever use home-dry cleaning products? Thought I’d give it a try with recent thrift purchases. That peachy color is perfect on Terri – the dress is very flattering on her! Beautiful! So glad your health is good, Nicole! Happy Thanksgiving, ya’ll! I love Terri’s blazer and blue shirt. So pretty! The dress is beautiful too. 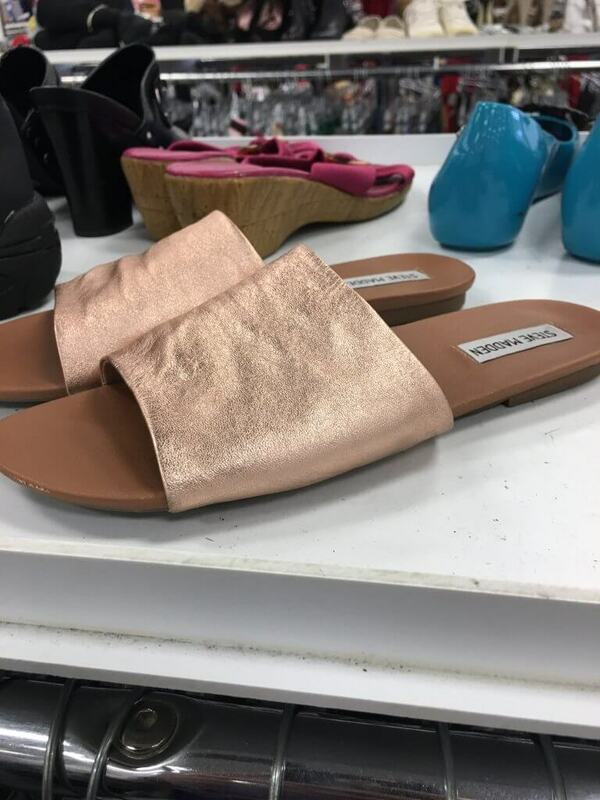 I also love the BM jewelry sandals!! I was actually thinking what a good idea, to feature them with simple, natural nails and jeans so as not to detract from their sparkle. I think there is more of a trend now for the clean, natural look for nails ..to have them purposly look minimalist, youthful and classy. Nice score Terri!!!!! The pineapple dress!!! !and the colour of your gown is perfect for you! Beautiful. It is gorgeous on her! She was taking it on her cruise too! Fun fun fun! Terri, you look beautiful in the dress! I think the colours in the floral romper suited you too but I understand rompers aren’t very practical. Sparkly loafers are fantastic, what a good purchase. 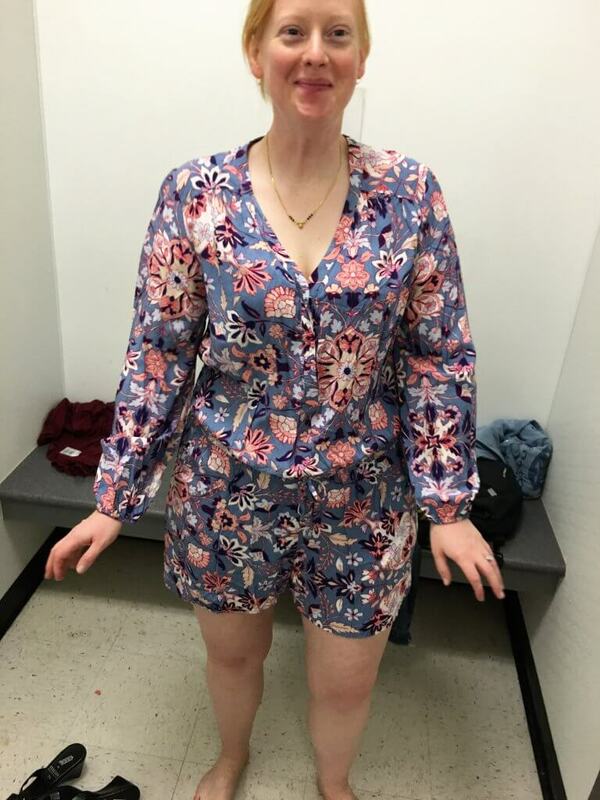 I can’t figure out why some rompers have long sleeves! That’s calling for some pretty specific weather if you ask me! I like having my nails and toes done but it’s not that important to me in the grand scheme. I care more about the pieces themselves! Terri does look gorgeous in that dress! Thanks for reading! My name is Nicole. I am spirited (as in attitude), I like spirits (as in beverages) and I love thrifting (as in clothes). Copyright © 2018 The Spirited Thrifter. All rights reserved. Designed by Mike Johnston.